While clearing items around the house, find stuff that you no longer need. 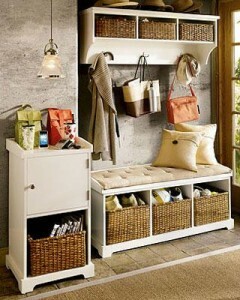 Throw or give them away to lessen the amount of things that you have to store within your home. If you feel that your storage boxes are running out of space, opt to throw out the items you no longer need. Whether its old clothes or broken toys, if you are no longer in need of it, then don’t let it accumulate precious space in your home. Fix a storage location for each and every item in your home and keep the items that you use daily within easy reach. If you do not have a specified place to put your things, then the most obvious result will be a mess, as things will keep piling on the tables, countertops, etc, until a point in time, when you get fed up of it and get to some thorough cleaning. Have you ever had an ‘odds and ends’ drawer in your house? The one place, where you put every item that makes you wonder, what to do with it? Well, doesn’t it become messy after a while? You’re storing your stuff, but you’re not trying to store it effectively. Even within drawers that hold your random items, use drawer dividers to separate it into sections. Place your stuff accordingly so that it not only becomes easier to find the stuff you have stashed there, but it also allows you to clean the drawer in a better manner later on. You can also opt to install shelves within your home rather than having boxes and drawers for extra storage. It not only saves your floor space but it also adds to the home décor. If you can’t maintain the look of the shelves, then insert shelves within your spare closets to make optimum use of the space you have available. If you’re unsure of what exactly you need to keep within your home, try this simple technique. Whether its clothes, toys or just kitchen appliances; put all the things of the same category into a box. For instance, put all your old clothes into a box. If you require any of the old clothes, pull them out of the box and restore them within your closet. By the end of two months, any items that get left behind it the box, pack them and give them away; because you might feel like you must have them in your closet, but you are probably never going to need them again. If you wish to live a life that is free from clutter, then you need to stop buying things on impulse. Always have an organized shopping list with you when you go out, and before buying something extra, envision your home and ask yourself if you have the space to store this new purchase within it. Effectively storing things can result in a more organized home, where everything is put in place at the end of the day. For those of you who can never get into the habit of putting things back in place, there’s just one solution to the mess you make; clean it up! However, if you cannot clean up the mess you make; then hiring a professional cleaning service is the perfect solution for you. So call up the experts that can provide you with a cleaner and healthier home!